The country's largest, most exuberant festival is Carnaval, which is made into a five day holiday weekend by most people getting the Carnaval Monday and Tuesday preceding Ash Wednesday off. 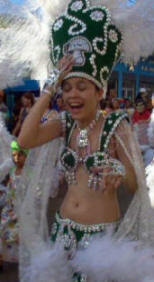 Characterized by music, dancing, parades and masquerades, the flavor of the event varies from region to region. Days are full of papelillos, disguises, surprises and games. All around the country, children, youths and adults enjoy the traditional music. Venezuela is a country of striking natural beauty and dramatic contrasts: the snowcapped peaks of the Andes in the west, and steamy Amazonian jungles in the south; the hauntingly beautiful Gran Sabana plateau, with its strange flat-topped mountains, in the east, and 3000km (1860mi) of white-sand beaches fringed with coconut palms line the Caribbean coast. South America's largest lake, Lake Maracaibo, and third-longest river, the Orinoco, are also here, and the country boasts the world's highest waterfall, Angel Falls. It is also home to a wide variety of exotic plants and animals, including the jaguar, ocelot, tapir, armadillo, anteater, and the longest snake in the world, the anaconda. Los Tambores de Bariovento, with its large black population from the nearby centuries-old coffee and banana plantations, is known for its African drums [Tambores] and other percussion instruments that are mostly Afro-Caribbean. The Drums of Bariovento are celebrated at the beginning of the rain season in March, near Corpus Christi, in Bariovento, Miranda state. Bariovento is comprised of the towns Curiepe, Higuerote, Caucagua, & Tacarigua. Cumana was the first European city founded in the Americas - in 1521 by Gonzalo de Ocampo. 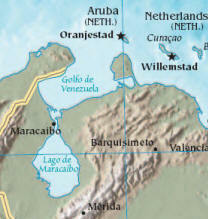 It's located in the Gulf of Cariaco in the Oriente, the East of Venezuela. The capital of the Sucre state, it has a rich colonial legate: forts, castles and churches. The Sucre state is one of the wildest of all Venezuela and not known to many tourists. In the interior of the country Venezuelans celebrate carnival with dances such as La Burriquita, El Pajaro Guarandol, El Carite and the theatre of La Quemada de Judas in which a symbolic Judas is thrown onto a pyre and burnt. In Zulia, the mamarrachos, daubs and the viejitos come out to perform in a traditional parade of disguises. Discover the Doll of the Calenda, a mysterious dance with the most diverse and curious of characters. world66.com//maracaibo: MACZUL is South America's largest contemporary art museum... Great night life with a diversity of nightclubs and cafés which can be found on the main streets of 72th, Dr. Portillo and Santa Rita Avenue, Visit Vereda del Lago park with its magnificent lake view. Mérida organizes for the dates, carnestolendas, of the internationally famous Fair of the Sun. This fair had its origin in the celebration in honor of the Virgin of Immaculate Conception. This had been traditionally held in the month of December, but for weather and other reasons the celebration was moved to coincide with the Carnaval beginning in 1969. A highlight is the city parade of its comparsas, costumes and bands. During the nights, streets fill with the festive air of people looking to party. Some go to celebrations organized by clubs in special ballrooms, while others are content to roam the city center. In the Carabobo state, Tuesday of Carnival vibrates with diversions such as the Donkey, Hamaca, the Cayman and the Scorpion. The dancing can be seen in several towns, all within a day's drive of Caracas. Most are found along the coast, but the oldest and most famous is at San Francisco de Paula de Yare (in Estado Miranda to the south). Here the devils dress in red and yellow and sport ferocious papier-mache masks. During the day before Corpus Christi, the devils hold a night-time candlelit mass called the Velorio de los Diablos Danzantes. The devils pay penance at their carnival, and the number of horns that these devils wear show the number of sins for which they are paying. Los Diablos de Yare encompasses several cities and states. In Naiguatá, the devils sport costumes decorated with circles, stripes and crosses and masks of terrifying sea creatures. This is the one place where women dance with the devils, who, uniquely, are not organized into a brotherhood. On the Wednesday before Corpus Christi the devils are called by the ringing of bells and three beats on a metal drum called a Caja. They descend upon the town and run amok before falling upon their knees to pray in front of the church. The devil dancers of Ocumare de la Costa, Chuao and Turiamo also celebrate spectacularly. Venezuelans are mad about traveling to visit friends and family over Christmas, Carnival (several days prior to Ash Wednesday) and Semana Santa (Holy Week; the week before Easter Sunday). In these three periods, you'll have to plan ahead and do a little more legwork before you find a place to stay if you, like many Venezuelans, are headed to the coast. "Carnival has lost its importance in the major cities, and is taken more seriously in the coastal towns"